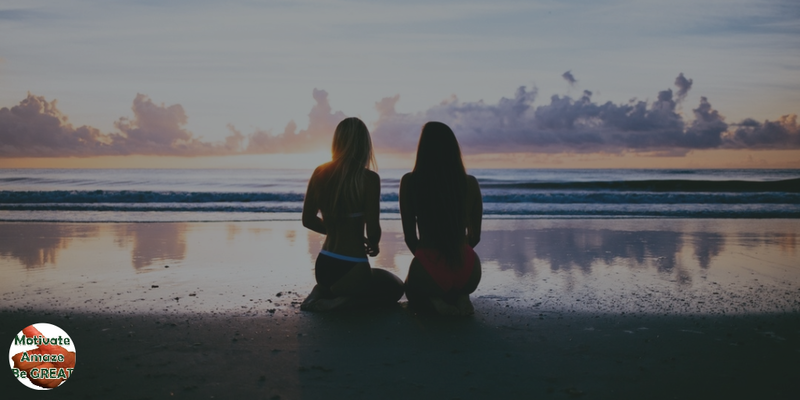 17 Ways To Boost Self-Esteem And Confidence In Women - Motivate Amaze Be GREAT: The Motivation and Inspiration for Self-Improvement you need! Every person should have good self-esteem and confidence to achieve success. If you rate and appraise yourself on a great level, you are able to take more difficult tasks which means growing as a person. All in all, the more confident you are, the more you can achieve. However, most women have a difficulty in growing self-esteem and confidence, but it's highly important to believe in your strengths in order to keep achieving your goals. 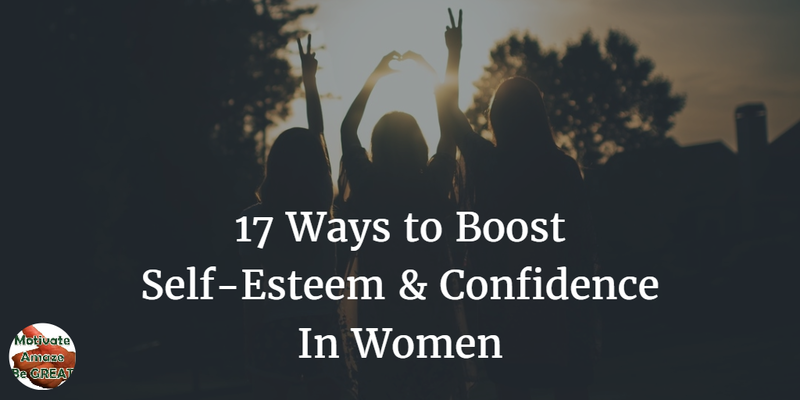 There are 17 ways that work well for most women who want to boost self-esteem and confidence. Women always worry about their attractiveness, and their appearance plays an important role. If you love how you look, you feel confident. So, grooming is not just about personal hygiene; it's also about your mental health. If you know that you look nice, that's great. If you get compliments from other people, that's even better. It helps to realize your value and boost self-esteem without making much effort. However, it's important to learn how to take compliments the right way. Being good at something is perfect! If you know something better than other people do, you feel valued as people might ask you for a piece of advice or some tips. Thus, find a niche you're interested in and become an expert. Have you ever went on a date with a stranger? If no, it's high time to give it a try. Women feel happier when someone asks them for a date, so spend some time discovering a new person, at least, just for fun. To be proud of yourself, do something you're afraid of. For example, try skydiving or invest some money in a business you would like to. All in all, you will never know whether it works until you try. Achieving small goals helps us earn confidence. Write down things you would like to accomplish and start working on them. Success comes with a goal achievement. Going in for sports is a great way to improve health, distract from negative thinking, and achieve your perfect body shape. Find sports activity you like and go in for it. Treat yourself as none does it before: buy things you love, go to the beauty salon, or visit a fancy restaurant. Believe it or not, the more you spend, the better you feel. Plus, if you spend money on yourself, you start working harder as your requests are growing. You deserved it! All people have fears, but just a few of us work on overcoming them. Once you've defeated your fear, you start living a better life. Being a happy person means having great self-esteem, so do yourself a favor. Visualization is a key to success when it comes to measuring your achievements. Write down all goals you've achieved to analyze them. I believe that you have a lot of things to be proud of! Most modern women want to achieve business success. It helps to grow revenue and improve confidence. Thus, do your best at work to feel valued as it's another sphere of your life that can boost your self-esteem. Do you have a woman who inspires you? There are many examples of successful business ladies who succeed in both business and personal life. What is their secret? They never stop growing as a person! Learn from them! Although most people don't like to be criticized, especially women, it's important to understand how to make the most out of it. Learning from your mistakes is great, but you need to avoid destructive criticism as it gives you nothing but bad mood. There are so many things to try in the world, and you can find a new hobby that brings you joy and happiness. Once you find it, try to develop in this niche. Plus, it's a way to earn respect from people who are inspired by your talents! Well, all women love to take photos. We love to share them on social media, get likes, and read pleasant comments. If you feel bad, order a photo shoot as it's an actionable way to improve your confidence! If you do something great, it's more likely you can get a positive feedback. Listen to people who value your work and praise yourself! You've done a good job, and you deserve t get this feedback! Being proud of yourself lifts your self-esteem. If you have something on your mind that you want to do, don't think twice if the idea is great. It's scientifically proven that women need to maintain their confidence and self-esteem. While we boost it from men, it's important to do our best in order to lift these qualities as well. The above-mentioned list might help you find out actionable ways on how to become a happier woman. Believe in yourself, and the whole world would believe in you, too. Please share this page with your connections so you too can help the women you know boost their self-esteem and confidence. You can simply copy the link or use the sharing buttons on the side and below. Lale Byquist is a student who wants to grow as a person, so she has crafted PresentationSkills.me website to share her tips on overcoming the fear of speaking in public. She is fond of traveling, reading, and communicating with different people, so don't hesitate to drop Lale a line at her inbox.